Tim Tebow and friend Mario. Screencap via the Tim Tebow Foundation. 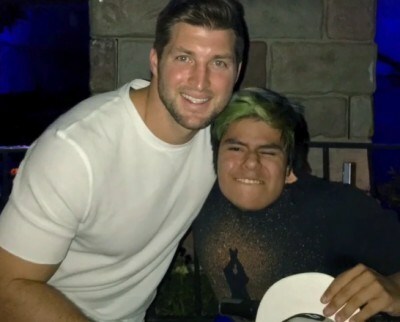 The Tim Tebow Foundation recently shared a heartwarming story on its Facebook page about the former NFL quarterback’s recent meeting with an adorable fan named Mario. [Pam] Tebow and her husband were Christian missionaries in the Philippines in 1985 and they prayed for “Timmy” before she became pregnant. Pam entered into a coma after she contracted amoebic dysentery, an infection of the intestine caused by a parasite found in a contaminated food or drink. The treatment for the medical condition would require strong medications that doctors told Pam had caused irreversible damage to Tim — so they advised her to have an abortion. Tebow refused the abortion and cited her Christian faith as the reason for her hope that her son would be born without the devastating disabilities physicians predicted. The video shows that Tim and Mario played games, road the rides, and palled around for three hours. What an amazing young man, one who manages to put things in perspective for so many with a bright smile, infectious giggle, and big heart. God bless you, Mario. And to Tim Tebow, thank you for continuing to be a positive role model for young and old alike. We need many more like you. To learn more about his W15H Program, which provides children with life-threatening illnesses the chance to meet Tebow, click here.